Twelve years ago, men and women from three continents began gathering in a set of prefabricated offices within the premises of CEA Cadarache, one of France's major nuclear research centres. They were the vanguard of the largest international collaboration ever launched, a massive research project that aimed to demonstrate that an artificial Sun could be trapped inside a machine. ''Newsline'' may have changed in look over the years but it has always had the same mission: informing the ITER community, stakeholders, researchers, fusion enthusiasts, and the general public about a unique project underway in southern France. The original seven had arrived in February 2006. By October, the "team" had grown into a few dozen and formed a community. As new people kept joining in, as the ITER administrative, scientific and technological structures were being established throughout the world and as social life began developing outside the prefabricated offices, the ITER people, like any community, needed to be informed. The ITER stakeholders, the researchers in their fusion laboratories and universities, the fusion enthusiasts throughout the world, and the general public shared the same need. Something unique was happening in southern France: supported by 35 nations, the dream of three generations of fusion physicists was beginning to take shape. Newsline was established to tell that story. Its first issue, which came out on 18 October 2006, covered most of the topics that were of interest at the time and that continue to be of interest today: news from the recently established Domestic Agencies, a report on a fusion conference, the profile of a new recruit, and the account of a gathering of "family and friends" at the "exact future location" of the ITER Tokamak. "As we all know, communication and public information play a vital role in a project like ITER," wrote ITER Director-General nominee Kaname Ikeda in his editorial. "I am convinced [...] that throughout its construction and its operation the significance of this project needs to be well understood by the public, and all stakeholders need to be well informed." Over the past twelve years, through three Director-Generals and four Heads of Communication, Newsline has done its best to fulfil this mission. A monthly publication back in 2006 and 2007, it reached cruising speed in 2008 and has maintained its weekly periodicity ever since. The publication has evolved. The chronicle of the nascent ITER community progressively gave way to a broader outlook on the fusion world, of which ITER is of course the centre piece. Over the years, through close to 3,500 articles, a considerable database has been accumulated. Most aspects of ITER science have been explored, the life story of major components had been reported from design through to completion, and progress on the worksite has been covered on a near-weekly basis. Newsline has travelled to factories and laboratories throughout the ITER world; it has flown helicopters and climbed cranes to take in the full view of the construction site; it has sat through international conferences to report on the latest developments in fusion research, explored historical archives and collected memories of major fusion figures. The Newsline team has used every available means to share and convey the unique nature of ITER, its ambitions, its challenges. 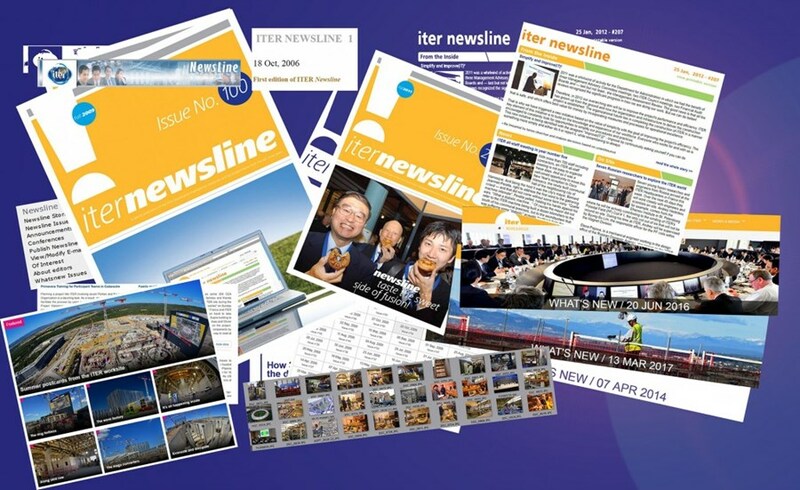 Outside the ITER community, Newsline has approximately 8,000 subscribers worldwide and thousands more access it freely through the ITER website. Its readership is diverse, ranging from the hard-core fusion scientist to the simple enthusiast. Catching the interest of the former without driving away the latter is the weekly challenge faced by the team. The Newsline team is not alone in writing Newsline however. Whether spontaneous or solicited, contributions from the fusion community (whether ITER Organization, Domestic Agencies, fusion laboratories or universities) are always a precious asset. Today, as we put together Newsline 500, we are already hounded by the ever-recurring Monday evening question: "OK, this one's out—but what do we have for the upcoming week?" To answer this question, we just need to look through the windows to the construction site, exchange a few words with colleagues at the cafeteria or read our emails from partners working around the world—the stories are all there, waiting to be told. ITER is a vast and fascinating world. Another 500 issues; another 3,500 articles won't be enough to explore it all. The content was not the problem; it was making the content show up in an orderly way on the webpage. Endless Sunday afternoons spent shifting and modifying HTML codes to position text modules and to convince the portrait or the photo of the Procurement Arrangement signing to appear next to it. No webmaster to help, no editorial board to assist. The public profile of one of the world's largest international scientific endeavours was shaped on a simple notebook at a kitchen table. April 2006: I had just taken up my new job as editor for the European Fusion Development Agreement (EFDA), the predecessor of EUROfusion, when things got rolling at ITER in southern France. To introduce themselves to staff that would soon be moving to France, all seven newly appointed ITER Deputy-Directors had come to Garching, the German hub of the project's three Joint Work Sites. "Conduct interviews, take pictures," said the EFDA Head of Communication Mark Westra. The visitors had returned home, when a few days later the phone rang. A French country code indicated who was calling: "We have to build up a communication office. ITER needs proper communication tools." Officially still employed by the Max Planck Institute, it was decided that we would spend one week per month in France to assist with all the odd communication tasks of a young international organization and to establish a periodical online magazine, the ITER Newsline. During the week we would fill our basket with stories and images of events such as the signing of the ITER Agreement at the Elysée Palace in Paris (2006); the ratification by all Members and the official establishment of the international organization (2007); the first Procurement Arrangement signature (2007); new appointments, achievements, meetings; the step-by-step establishment of the seven Domestic Agencies; and the first ITER snowman! Back at home, the harvest was arduously brought into shape with HTML, beginning with the first Newsline published on 18 October 2006. As the Organization grew, so did the Communication team. The arrival of a webmaster finally brought about a big transition, enabling the "homemade" publication to develop into the professional and powerful communication tool that we know today. --Sabina Griffith, Newsline editor from 2006 to 2012.